For Coach's latest collection, Stuart Vevers re-imagines the American journey, combining the sub-cultures of music, skate and surf, with the suburban as a backdrop to its big-city juxtaposition. With Coach's signature style of luxe and structure, the new collection breathes an edgy streetstyle angle to the Coach brand that sees them exploring the tension of utility and luxury--of creating looks that reference the workwear silhouettes of the mid-west with the fast-paced boldness of New York. While their last collection focused on the Coach Dreamers, this latest collection puts a spotlight on the All-American Dreamer: an optimistic, smart outsider who dresses with a cool, effortless ease, and a sense of spontaneous freedom. The collection features a graphic, colourful, and vibrant take on boyish femininity--all injected with a sense of nostalgia and tradition that goes hand-in-hand with Coach's latest collaboration with Gary Baseman. These are looks that bring a surprising twist to the familiar, a re-imagination of the American, big-city silhouette. Inspired by Stuart's vision of that all-american Coach girl who favours vintage silhouettes, this knee-length dress brings a different take to the sweet, suburban girl-next-door. Gary Baseman's art printed throughout the sheer fabric brings a touch of quirk and boldness to an otherwise simple, everyday silhouette. Inspired by Daphne from the popular 70's era cartoon Scooby-Doo, this look is all about that all-american cool girl. The flares, graphic shirt, and bright orange blazer ensemble brings to mind traditional tailoring with an irreverent, casual twist--perfect for achieving that work-place city chic. A quintessential American fabrication is the classic combo of a jean jacket and skirt; and this ensemble brings it all back into focus. With its studded trimmings and clean white palette, it's all about embodying that cool girl vibe of hanging out with the band at the local bar. In line with Coach's tailored and luxurious image, this look is inspired by that luxe sense of nonchalance. An uptown girl with her bold, tailored jacket and structured Coach Swagger bag who isn't afraid to express her sense of individualism and spontaneity with her bold choices. At the root of it, the all-american girl is never afraid of making a statement in that imprecise way that's hard to replicate. 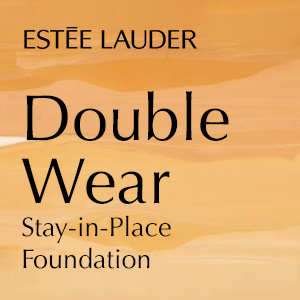 This look is essentially a gathering of found pieces, of putting together an ensemble that is unconventional yet still rooted in the basics--of taking the girl from the suburbs and letting her express herself in a big-city way. What do you think of COACH's new collection? Let us know in the comment box below! 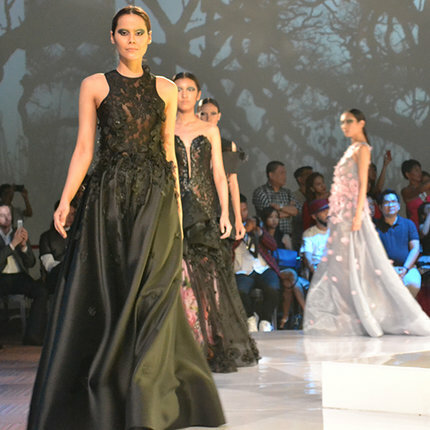 It has been more than two weeks since Manila Fashion Festival but the rave about it is still alive amongst us Clozetters. We couldn't stop talking about our favourite collections, which were a toss between designers that resembled our personal styles and designers with looks we've only dreamed of wearing. Overall, it was 4 consecutive nights of runway elegance and fashion innovations--and the best part was that the Clozette Team got to share it with our dear Clozetters in the Philippines! 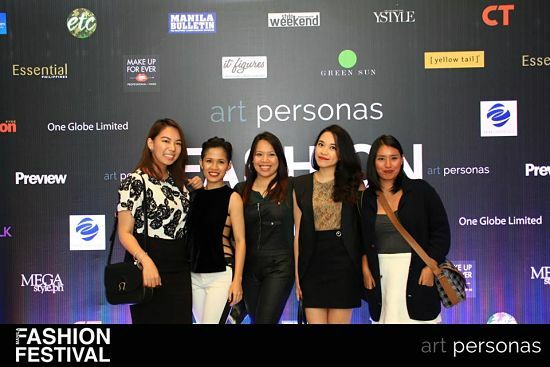 So we caught up with the Clozetters we spotted at #MNLFashionFest to get the low-down on what they wore and who their favourite designers are. On her look: "I wanted to wear black but at the same time didn't want to stick to the usual black & white mix. So I opted for a brown top to go with my black skirt and vest ensemble. I also like adding texture in my outfits, so the lace top kept the outfit from looking too plain and flat." Her favourite Designer/Collection: "I loved how the collections were pretty diverse so it's pretty hard to pick one favourite. But aside from the standouts, I also really enjoyed Banggo Niu's collection. He definitely impressed with his high energy display and edgy I'm-a-cool-girl clothes." 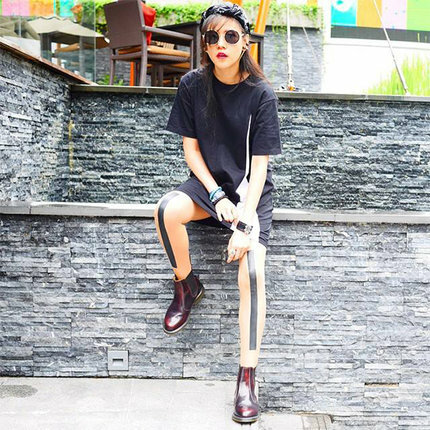 On her look: "I almost always wear heels, but I wanted to try my hand at this sports luxe trend. 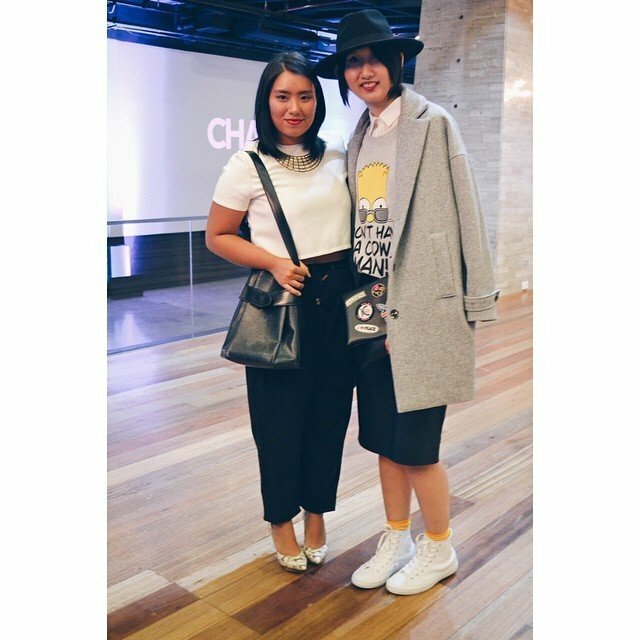 So I wore my gold LZD sneakers with a velvet cutout top by designer John Chan to achieve the look." Her favourite Designer/Collection: "There were lots of collections that I liked, but I'll go with Michael Leyva because his creations were ultra glamorous but still wearable." 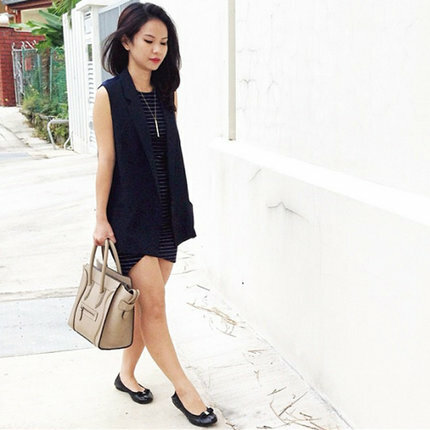 On her look: "Monochrome is my go-to colour scheme. 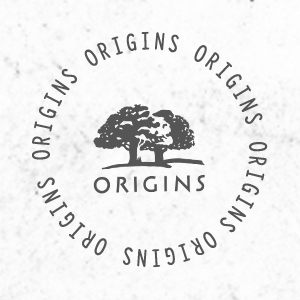 I think it's perfect for special occasions because it's timeless." Her favourite Designer/Collection: "Vania Romoff's F/W 2015 Collection was the best for me because it reminded me of one of my favourite books when I was a kid - 'The Secret Garden!' 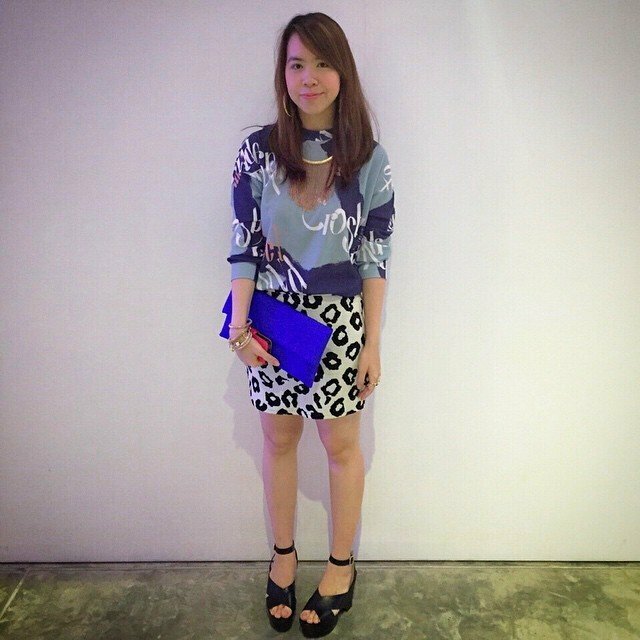 "
On her look: "I wore Bottomline crop top, MDS Collection skirt, Pedro heels, & Charles Keith sling bag. I chose to wear this during the event because of the skirt. 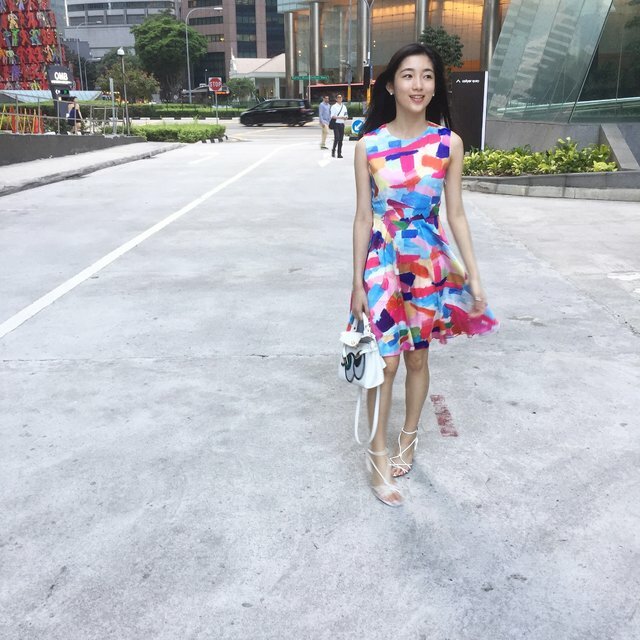 I find the print really cute and unique." 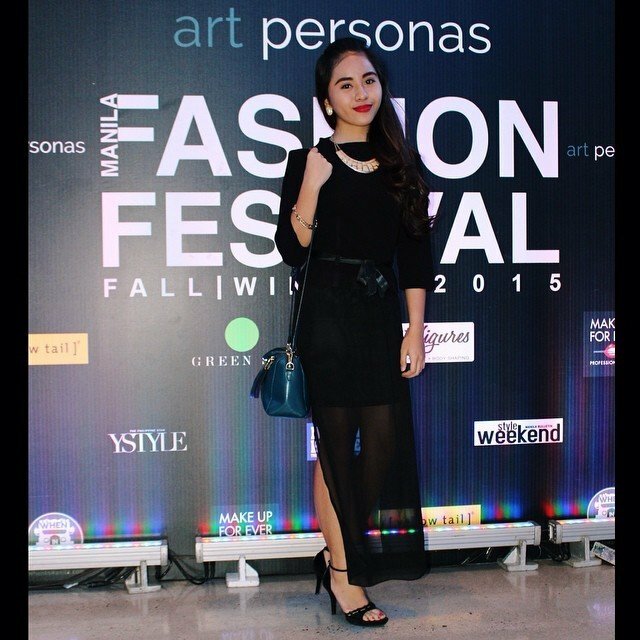 Her favourite Designer/Collection: "Happy Andrada & Jot Losa." On her look: "I believe that tropical print doesn't require jetting off to an exotic island. It makes a cool statement as the temperature heats up. I simply re-worked the Tropical printed crop-top into a stylish outfit. I paired it with my green textured high-waisted short to let the pattern be the focus of my ensemble. I added a textured blazer to add an empowered vibe and finished it off with my go-to stiletto." 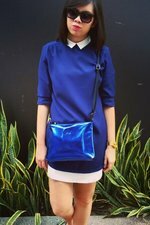 Her favourite Designer/Collection: "I like Banggo Niu. I'm so attracted to his fresh and playful designs. His creations centred on the sporty chic look with an 80's vibe. Shimmers and leather plus jersey letterings dominated his collection and I loved it. I find it elegant. 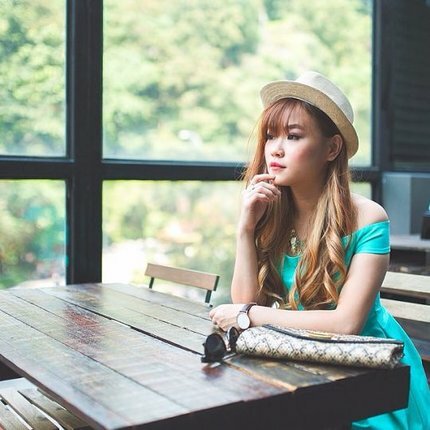 With Banggo Niu's creations, you'll definitely DRESS with a BANG." On her look: "My top was from designer Alexander J. Bitong, Maxi skirt from online shop www.rosegal.com, heels from Kenneth Cole, and bag from Coach. 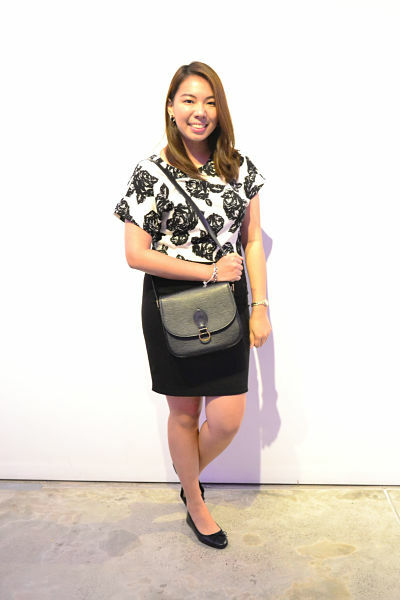 Obviously in fashion shows, black and white ensembles stands out the most so I wore something monochromatic. Black can really make you look sophisticated. 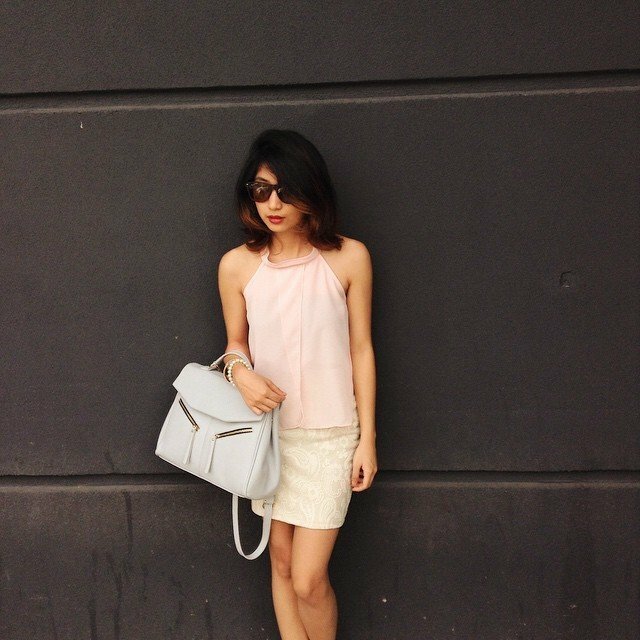 With my top, I opted to wear a top from a designer--it's always a classic choice." Her favourite Designer/Collection: "My favourite designer was Vania Romoff as she is one of the leading designers of today's generation and I just love her collections! It's very classic and feminine from her soft flows and classic silhouettes. She always creates beautiful designs. Her collection was to die for!" On her look: "I wore a sheer top from Zalora, lace bandage skirt I got from a bazaar, flats from Alberto Asumague, and bag form Zalora. 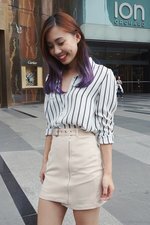 As I am always dressed so dark, I dolled up myself with pastel colours. With spring/summer upon us, it is time to lighten up our wardrobe and jump into a pastel wonderland!" Her favourite Designer/Collection: "My favourite designer is Vania Romoff"
On her look: "Sundays are always casual days for me. 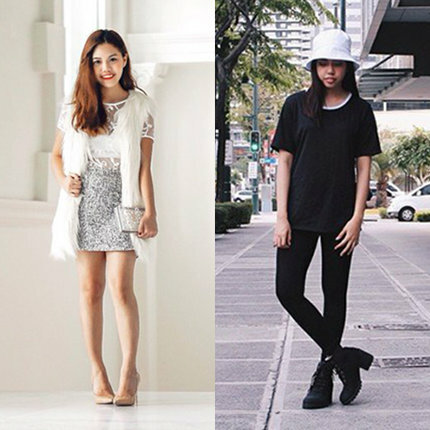 So I thought of wearing black shorts and black tops. However, knowing that it is an event, I wouldn't want to go too casual. So I've picked a flowery blazer and black shoes to finish my entire ensemble." Her favourite Designer/Collection: "I loved Vania Romoff's collection. The dresses simply spoke to me of ethereal elegance. Of all the designers there, hers was the ones I would really love to wear. It reflected my personal style--simple, classic, and clean colours. " On my look: "I always play on the safe side, especially during events like this. I opted for my no-fail black, white, and gold pieces and played it out with the structure. 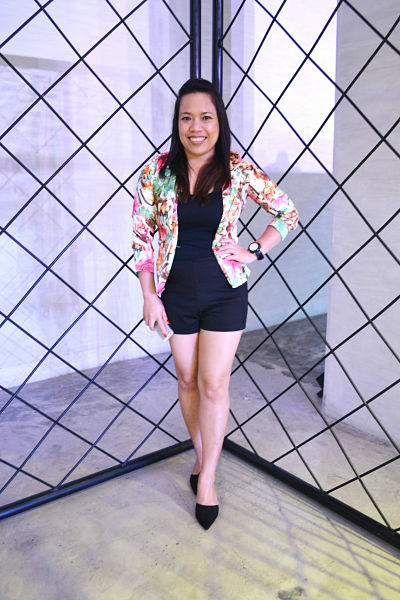 A crop top and sheer jogger pants, paired with snakeskin heels and LV bag is the perfect classy look for me since I had to make my look comfortable enough for taking photos of the event." My favourite Designer/Collection: "It's actually a toss between Vania Romoff and Cheetah Rivera's collections. Both used quality fabrics and feminine silhouettes--which I always dream of wearing someday in a very glam event. Very classy and wearable." 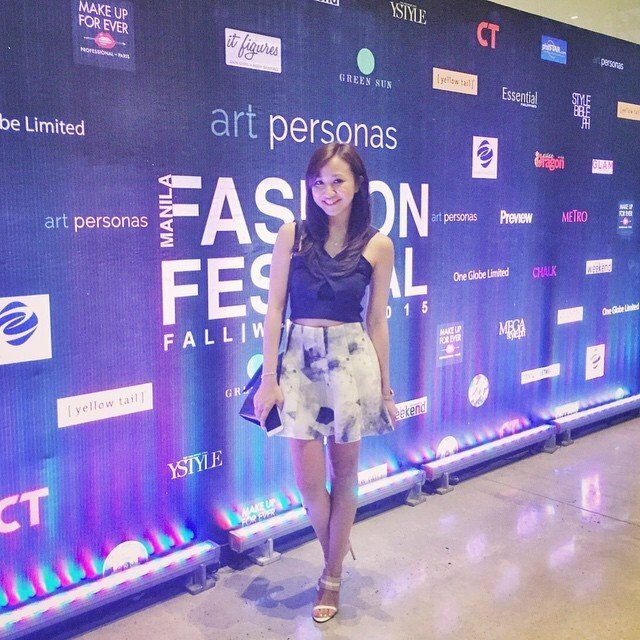 On her look: "Manila Fashion Festival is the perfect event to take fashion risks! I tried to go out of my comfort zone by wearing something different than what I usually wear (mainly black & white). With that in mind, I decided to pair contrasting colours & bold patterns from my wardrobe together with some chunky accessories to complement each other. 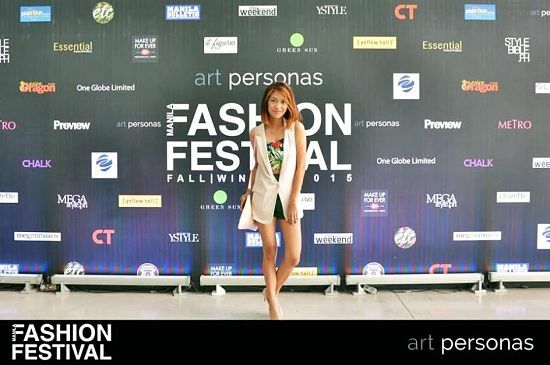 The look was definitely new to me but Manila Fashion Festival was definitely the time to make a fashion statement so I dared to be a little different." Her favourite Designer/Collection: "My favourite designer would definitely be Cheetah Rivera. The beautiful Swallow embroidery on her dresses really caught my eye, plus the tailoring and fit was impeccable. Not only that but her use of bold primary colours and edgy modern cuts gave her designs the right amount of edge & sophistication which perfectly embodies the modern day woman. Second favourite collection of mine would be Mark Bumgarner. I loved how he elevated the evening gowns by giving each one a unique look--may it be a different cut or an embellished collar. His most memorable design for me would be the tailored slacks with the embellished turtle-neck top that trickled down back with a trail or a long cape of sorts. It wasn't necessarily an evening gown but the combination was fresh and new which made it as equally jaw-dropping as his other designs." What was the latest fashion show you watched and which designer was your favourite?